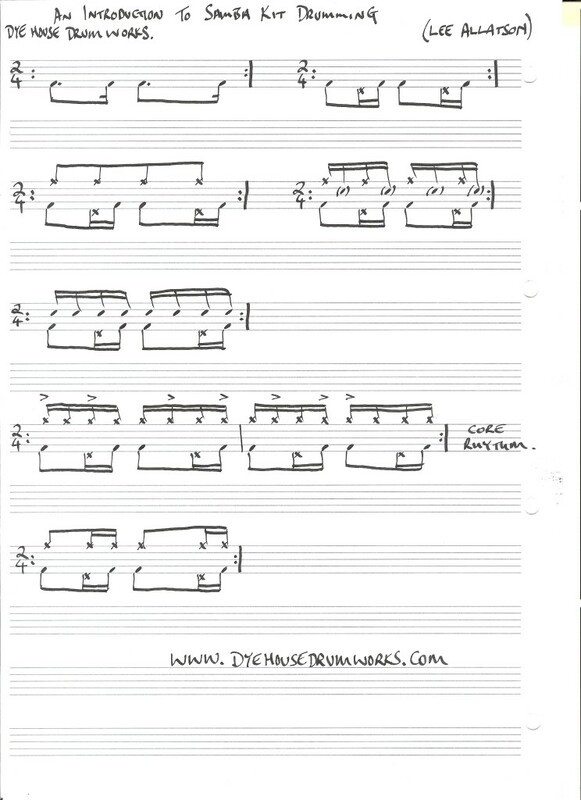 I have been working on some new tuition videos for our Dye House Drum Works Youtube channel and thought I would also post the hard copy exercises here. These could be a useful study aid to work in conjunction with the videos (check them out!) though I will also add some comments here to illustrate the notation more directly. Here is my Introduction to Playing Samba Drum Kit! The accompanying Youtube video can be found here. The top line sets out the most common, basic pedal movements as a foundation: the ‘heartbeat’ bass drum pattern – then with an off-beat pedal hi hat added. Moving back to the hi hats, 1/16’s can be used with accents to create a more laid back feel to the groove (see the exercise marked ‘Core Rhythm’: check the demonstrations on the Youtube video which accompany this tutorial. The final exercise also leaves a little more space for melodic and harmonic content to be heard, using only the ride cymbal in ‘broken sixteenths’ over the pedals. Remember that samba is a dance music: inject as much life and feel as you can into these exercises and practice looping them round as you begin to improvise over the pedal ‘ostinatos’ (repeating phrases). Keep it simple to start and don’t forget to reflect the the spirit of the carnival in every note you play of this music. Good luck!